I’m posting a lot less about gear nowadays, but that doesn’t mean I’ve gone off it! I took a number of new or newish things to Wales with me and did a few things differently for this trip. Here’s how they did. Because I had stocks of other brands of food to work through, I’d not got around to ordering any of these, and then they temporarily went out of business just when I was ready to buy some. Because I was expecting to carry so many days food for the drag up from Llandovery to Barmouth this time, I decided that weight was a massive issue, and as the Fuzion are much lighter than my existing dehydrated food (albeit for less calories too), I’d get some. So I ordered a big batch, packed some in my rucksack, posted some more in a parcel to Llandovery and still had a good amount for future trips. Or in other words, I put faith in other people’s opinions of these and bought a massive batch. Minced Beef and vegetables – this was ok, but better breaking up of lumps before adding water would have improved it. There’s not much to say about this – it’s mince and veg so is never going to set the world alight. Best described as inoffensive. Chocolate Orange Rice Pudding – so nice did this sound that I bought 3 and took one and posted one. It was horrid, but I’m hoping this is down to my incompetence in preparing it – not breaking the lumps up and adding too much water. As I still have two left, I’m trying to tell myself that it was all me and that it will be nice if I prepare it properly. Incidentally, the idea with this one was to take something I could use as a dessert if hungry but also that I could stomach for breakfast. That idea still seems like a good one, and breaking up the monotony of my usual porridge mix is something that is definitely attractive. Chilli con carne – this was awesome. With the lesson learned from the rice pudding, I prepared this one properly and it was probably the nicest thing I’ve eaten in a tent. Having said that, none of the chillis I’ve had from other brands have been bad, so I think chilli just lends itself well to this format. The Fuizion one was particularly good though. Verdict: definitely worth persevering with, but because they’re so expensive (nearly £7 for some main courses), they’re only going to be used on longer trips where the amount of stuff I have to carry is more of an issue. I was surprised at how bulky they are for such a low weight. A Facebook post about the merits of Fuel4, and testing it on a Honey Stove (which I was already aware of) alerted me to a small metal grill plate that I could see me using. I’ve long been wanting to cook things other than heating water on a backpack, and something small and lightweight that would enable the cooking of meat, or toast for example had to be looked into. When I found out it was part of the Honey Stove I did more investigation and after some further prevarication, I got a stove, not just the grill plate which can be bought separately. I thought if I was getting one, I might as well get the titanium otherwise I wasn’t saving anything over my existing Trangia Triangle setup. So in other words, I jumped in fully. 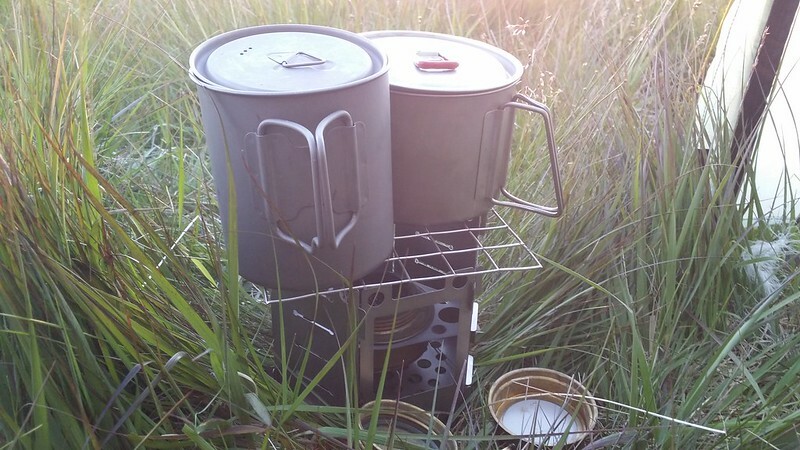 I used the stove for the first time on this trip, and after the expected tussle getting the bits to slot together without some of them falling off before I was finished, got used to it. I used it in both the square and hexagonal configurations, and much prefer the hexagonal – it’s clearly more stable and (just about) gives the ability to use two pots at once. It also enables the pot to be closer to the flame by letting it sit inside the windshield with the use of a couple of titanium tent pegs (not included with the stove and have to be bought separately). Clearly for any grilling I was going to do, the hexagonal configuration also drastically increased the surface area of food I could cook at a time. I didn’t get the opportunity to use anything other than Fuel4 although I went prepared to use wood if I should find any. Interestingly, this stove did help show up something I’ve been feeling for a while – in that I’m finding Fuel4 significantly slower than meths, having now used it in 3 different stoves. Fuel4 does have the advantage of being less toxic, charring the pans less and being more efficient weight-wise on a long trip, but is not the full replacement for meths I hoped it would be. I can still see me using meths for a while – especially as recent attempts to use up my remaining stock have been thwarted by the stove not using as much as I’d expected. I still need to try the Honey with meths and if that gives acceptable results, there will be absolutely no reason to keep my Trangia Triangle (which is a pretty similar concept in many ways, but heavier and less versatile). The Honey could also replace my full Trangia 27, a heresy I never thought I would hear myself utter. I’m certainly going to get rid of my Caldera Cone which I’ve never liked. Verdict: Looking good, and looks like enabling me to dispose of a couple of other stoves, which should offset what is quite a lot of money for a few sheets of metal. In the same parcel as the Honey Stove, as when ordering from Backpackinglight I run a list of stuff to get next time I’m ordering to save on postage, was this lantern. A totally luxury item as until now I’ve quite happily used my headtorch, but it was small and relatively light and I had loads of tealights to use up. I took to this from the moment I lit it. 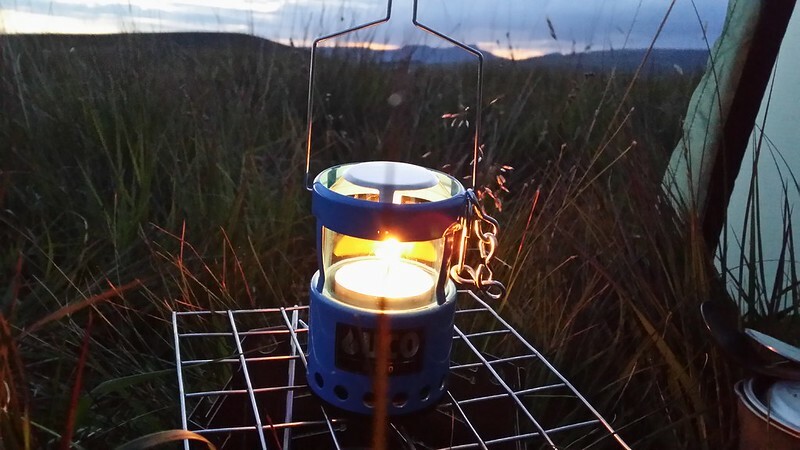 The lantern added ambience to the camp, provides a backup to the torch and is cheaper to run. I used it either sat on my Honey Stove (see picture) or hanging in the tent doorway. This latter use did cause an issue when I knocked it entering the tent and showered molten wax everywhere (I’m still finding it three weeks later). The wax solidified almost immediately so nothing was damaged, but the clean-up job was an irritant. This isn’t so much the fault of the lantern as my own clumsiness though. The top of the lantern pulls up for use and slots into the base part for storage. It can hold both the tealight in use and a spare in the base. The amount of light it gave out was almost as good as my headtorch and consequently I barely used my headtorch at camp. Verdict: although by no means an essential item, I enjoyed using the lantern and it’s weight I’m prepared to carry to make my camps better. 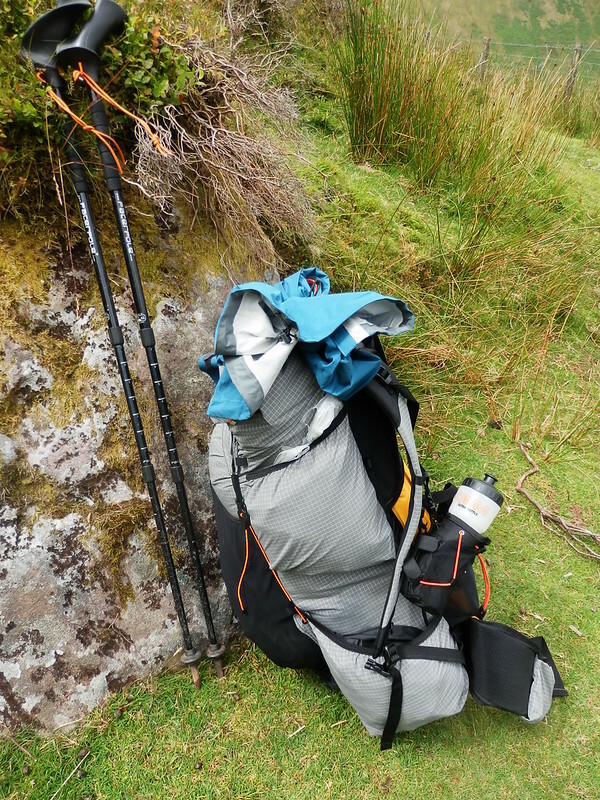 Big tall pocket on side of pack – holds my Scarp 1. Indeed this pocket was the single biggest reason I bought this pack. Being able to carry the tent on the outside like this I reckon is the main reason I can get so much inside the pack. Upper small pocket on side – on both of the recent trips I used this to hold my Fuel4 pouches and also my whisky flask. A second pocket above the normal one is a very useful innovation. Lower small pocket on side – used for a variety of things throughout the trip – on the way up it held my cheap £5 insulating mat and after that it carried my rubbish, or full water bottle. I also tend to tuck the balloon pump for the Airbeam frame in here, so have to be a bit careful about packing this pocket too tightly in case it causes the back frame to deflate. Front mesh pocket – typically I put my water filtration stuff in here so it’s handy, plus any clothing I’ve taken off or items being dried. 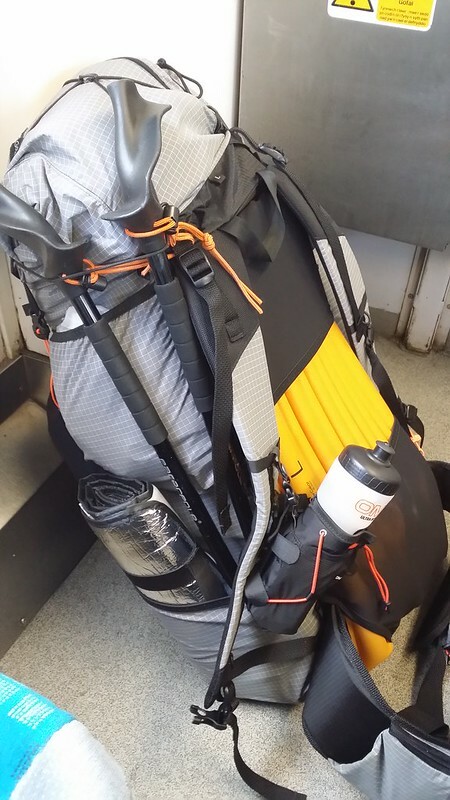 For this trip, and in that same Backpackinglight parcel, I got myself an OMM i-Gamy bottle and holder, taking inspiration from Robin. I made the mistake of taking the bottle itself though, which was both heavier and less convenient than a normal shop bottle of water. It also tasted horridly plasticky. I carried the provided spare loop of paracord, but never had the need to use it. But this is another thing I like about the pack – it lends itself well to customisation. Verdict: I’m in love with this pack and am struggling to understand why I rejected it when I was looking for a new large pack. This was ostensibly because I wasn’t happy with its maximum load weight, but now I have one it’s not a problem. This is very much the pack I should have got instead of my ULA Epic. Suffice to say that I now have a ULA Epic for sale, having recently got rid of my big old Lowe Alpine pack as also surplus to requirements. Yes, I carried eggs on this backpack. And successfully too. One got broken in the tent overnight, but there was no damage whilst being carried. I got one of those yellow plastic egg carriers (you can get them in GoOutdoors, on Amazon and on several other online shops) to carry them in. Each morning I hard-boiled a couple of eggs to make my breakfast more interesting. 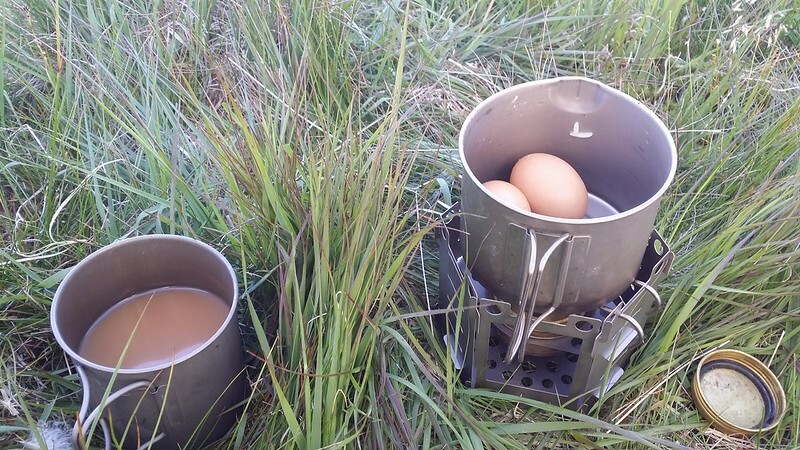 Although a bit tricky to eat when hot due to no eggcup (I used the Honey stove grill to hold them actually), these were another one of those morale-boosting things that I find beneficial on a longer backpack. Verdict: I’m so doing this again. Recently bought on a whim in the Blacks sale in the knowledge that my old North Face Apex pants were on the way out, these have been great and I’ve worn them in all weathers on this walk and the previous few trips. Whilst not quite as year-round as my Apex pants, they are noticeably lighter. I like these. Ok, I didn’t actually take a quilt, but every night on this trip I never zipped my sleeping bag up and simply used it like a quilt, albeit one where one end was joined up. This worked really well for this summer trip, and has of course set off thoughts about getting an actual down quilt at some point in the future which would save a little bit of weight too. There’s absolutely no urgency to this, but if I find myself doing this more, it may be worth investing in a quilt. That would then be something I could also use as an extra in winter. 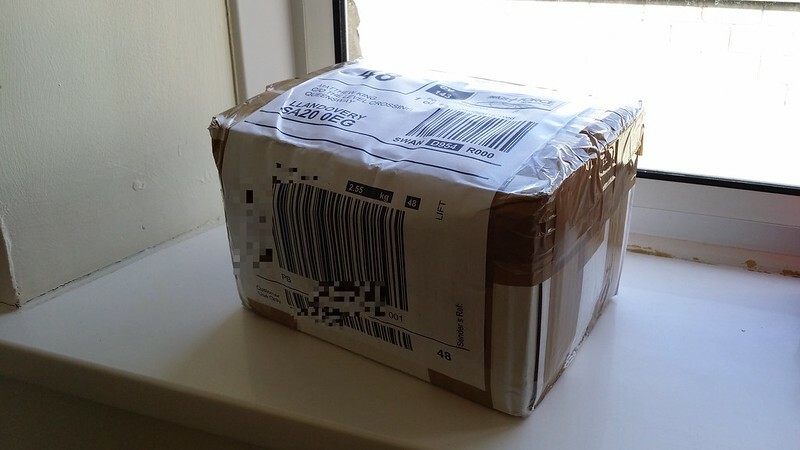 This was the first trip I’ve posted myself food parcels ahead. Unsure of the shops in Llandovery, and with a possible 6 days of uncertain supply from there, not to mention the weight of convenience store food, I wanted to carry dehydrated food on that section, so posted myself a selection of Fuizions and my Acme porridge mix, along with top ups of other things I might not get in Llandovery – such as tea (surely I could buy tea bags, but I only needed a few not a whole box). I also included maps for the next bit, and the intention was to post home in the same box anything I no longer needed. This plan worked well apart from one minor flaw – the fact that I never made it past Llandovery, and so the food parcel was unnecessary. I will consider doing this again, but one of the lessons from this trip, and indeed the previous year’s trip on the Cambrian Way, is that me and long trips don’t work that well. So the occasions on which I’ll do this will probably be few and far between. Whilst the trip itself didn’t quite work out as hoped, from a gear perspective it was really successful. It’s definitely helped firm up some areas of gear as to what I’ll be using by default going forwards and identified some stuff I now no longer need. Much of this is down to the Mariposa of course – I’ve been so long looking for the perfect pack, that now having found it, or at least as close as I’m realistically going to get, so much else slots into place around it. My wife will be pleased to hear this, as it means she can argue for me to get rid of some excess gear and to not buy as much new stuff in the future. By the way, all of the gear talked about above I bought myself, in case you were wondering. On long trips i can pretty much eat anything, having said that i tend to use Fuizion whenever i can. I think they re-hydrate better than others. I like the bottle holder and if i didn’t use the one i got with the travel tap i would get the OMM one. The Mariposa has a good following but i havn’t tried one as yet. Rucksacks tend to last me 5yrs +. So i’m not ready to change yet but its on my possibles list. It’s worth allowing Fuizion meals to hydrate for longer. I usually allow 12 minutes. If you use an insulation pouch, they are still piping hot. It improves the taste as well.